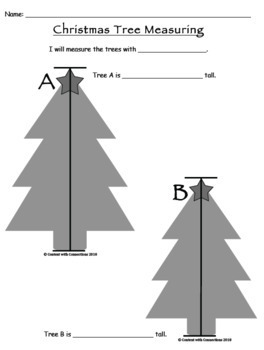 Christmas Tree Measurement is a great hands-on math activity for your students in December and is especially great for use with the book Mr. WIllowby's Christmas Tree by Robert Barry! Because you may want to use it with or without the book, there are 2 versions of each activity: one where the 7 trees are labeled with names of the books’ characters, and one where there are just 8 trees of various sizes for measuring. Use whichever ones work best for you! · Guide students in measuring each tree using non-standard measurement. I have provided rows of Christmas lights that you can print for students to use. They could also use mini pom-poms, M&Ms, buttons, or other small objects! 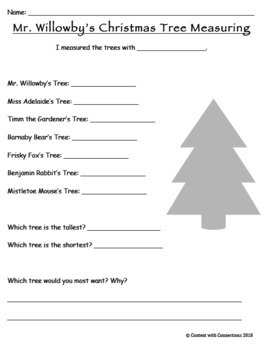 · Record answers on a Tree Measuring Recording Sheet and answer the reflection questions at the end. 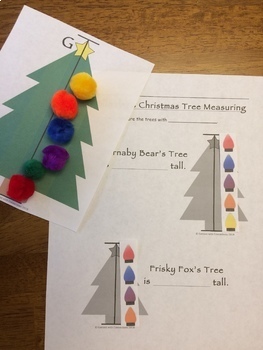 Students use the provided rows of Christmas lights, or other small objects such as M&Ms, mini pom-poms, or buttons, to measure each tree and record the answer next to the tree. A couple of reflection questions are provided at the end to summarize the activity. 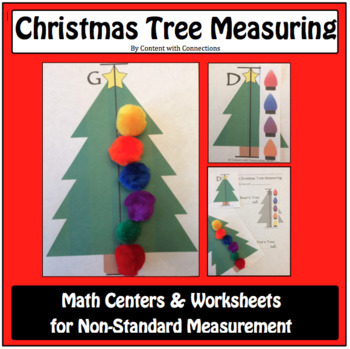 You may also be interested in these Christmas Counting Worksheets or this Mitten Measurement Activity.